Waiting List Notice: The number of orders we have taken meets the maximum limit for the 2009 Abraham Lincoln Commemorative Uncirculated Silver Dollar. You may still place an order for this product, which will go on a waiting list. If a product becomes available due to an order cancellation, we will fulfill orders from the waiting list on a first-in, first-served basis. We cannot provide information about your position on the waiting list. When we place your order on the waiting list, we will send you an order receipt. This is not a guarantee that you will receive your order. If we are not able to fulfill part or all of your order, you will receive a cancellation or sold-out notification. If you paid by check, you will receive a refund. The sellout is not unexpected, as CoinNews and other numismatic media sources warned of the likelihood more than once. The most recent sales figures indicated 296,488 proof and 126,963 uncirculated silver dollar were sold, for a total of 423,451. While the vigorous sales pace had slowed slightly in the last two weeks, even the most recent stats reflected that nearly 43,000 were scooped up within several days. Given the entire commemorative series has a total mintage limit of 500,000 with 50,000 reserved for a special five-coin Lincoln proof set, it was just a matter of time. The allotted individual proof coins are likely to lead into a sellout shortly as well. With the exception of the reduced odds of purchasing an uncirculated Lincoln Silver Dollar through the Mint wait list, collectors interested in the coin must look to the secondary market. Current eBay auctions have mostly graded specimens. 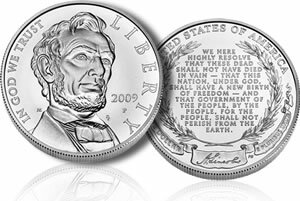 The Lincoln commemorative silver coins, as well as the four newly redesigned 2009 Lincoln Pennies, celebrate the 200th anniversary of Abraham Lincoln’s birth on Feb. 12, 1809.